Why Is It Important to Choose a Special Line for Trout? Are you ready for trout fishing? Trout is a very beautiful and individualistic fish, and it is well-known all over the world. Many people would describe this fish as the “freshwater queen.” Trout fishing can gift you with the most incredible and unforgettable moments and leave you a lasting impression. First of all, there are ample opportunities here in the US to catch trout all over the country. Consequently, companies launched millions of products related to trout fishing and they promise to enlighten you. However, we realized that the majority of trout fans have no idea which products are suitable for trout. There are thousands of lures, reels, and rods on the market and we think that the selection of these tackle depends on you. However, we would like to lay emphasis on the fishing line, as it can increase the fishing efficiency if you choose the right one. Thus, this article will help you choose the best fishing line for trout and show you some product selections. We would like to ensure you that our knowledge derives from many years of fishing experience. Moreover, we managed to talk with the most avid-obsessed trout anglers to provide the most accurate trout fishing information. Before we start analyzing trout lines, it would be a good idea to learn more about this beautiful fish. Trout is very strong, strikes abrupt, and it can break the line without any difficulty. However, if trout are small, they cannot destroy the line as their teeth are not sharp enough. We all fishers could describe it as very patient as it tends to inspect the lure-bait before striking. As we have already mentioned in a previous article, trout is not one fish, but it is a family of fish. For instance, the rainbow trout is a fish species that live in crystal clear waters. If you want to learn more about trout, please take a look at our article “fishing like a pro with these five best trout lures”. It is worth to know some basic information about the target fish, before getting our fishing tackle. That is the rule of every angler. Furthermore, these fish are keen-sighted, and they have even a good vision at night. Consequently, you should select a fishing line that is invisible in the water. It goes without saying that the line should be not only invisible, but also durable for two reasons. Firstly, trout have sharp teeth, and secondly, when you have the fish on the hook, it starts to fight to break your line. Generally speaking, the best fishing line for trout should be abrasion resistant. Keep in mind that you will need a great amount of line on your reel if you are going to pursue a really big trout like the brown. More fishing line means smaller line diameter. The technique is the major factor that you should take into consideration before you select line. Common techniques are fly-fishing, spinning and rarely casting (with a bobber or not). The best fishing lines here are mono, fluorocarbon or braided (Dyneema or spectra). It would be a good idea to use the mono line as the main line and fluoro as leader line. Monofilament line is elastic, and that is not good for trout fishing, but you can feel the bites immediately. Fluorocarbon line is completely invisible in the water, so trout will not notice it at all. Many of you would ask. Why should we not use only fluorocarbon line? The answer is that fluorocarbon line can be really expensive and almost all anglers use it only as a leader line. Certainly, you will not face any problems if you use braided or mono main lines. However, the last few years many people replace the mono line with braided because it is very strong. The only negative of braided line is that it is not abrasion resistant. However, manufacturers are improving the lines and it would be a good idea to use spectra braided line with eight strands. Dyneema braided lines with three strands are also suitable for our purpose. Undoubtedly, fly line plays a decisive role here. 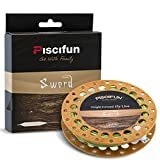 This line does not only connect the lure with the rod but also helps you to perform better casts due to the tremendous elasticity. The only problem here is that the diameter of the line is quite big and trout can see the line. We experts by Bravehunters.com suggest selecting fly lines that are similar to the fishing environment. It is the only solution as the color works as a camouflage in the water and most trout cannot see it. While you are shooting line, keep in mind that you should not try to reach a long distance. Fly lines are constructed in such way so you can shoot with the much less effort. Also, fly lines have a taper, and you should lay emphasis on this. Taper means that the line is not unvarying as it is thinner or thicker in some parts to give you better line control. Since our goal is to make the line invisible, you should prefer thin lines. You may think that thin lines are not durable enough. Conversely, this perception is completely wrong as many line types are made to withstand strong fish even if they are thin. Take a look at the table which will give you some tips according to the fishing technique and line. Tip for Newbies: If you are a new trout angler first and foremost welcome to the fishing community. The world of fishing is wonderful. We think that it would be a good idea to choose very strong lines for trout as you do not have much experience. Trout are clever and strong, and if you will have to “fight” with a big trout, there is no doubt that the durable line will “save” you. Berkley is a leading company in constructing fishing lines. 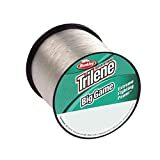 This specific trilene big game line is unique as it is very tough and of course abrasion resistant. Consequently, sharp trout teeth will not be able to ruin your fishing trip! 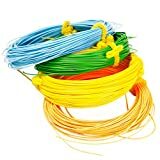 The fishing line comes in 6 colors, and all the six of them are similar to a specific water environment. Whether you are going to fish in clear waters or murky green, you have the choice to select the right color. After testing the line, we also realized that it is almost invisible in the water as the reflections are able to be absorbed from the water. Zero 0% Abrasion: Trout are quite aggressive fish, and they bite and make abrupt movements to break the line and escape. Sometimes they approach the rocks to ruin the line, so you need something really tough. The Berkley Trilene line is made of materials that will not fade or break even if you catch the biggest trout ever. Strong Knots: You will be surprised that the knots will be hard as a tank. Even if you are a newbie and you cannot make good knots yet, the line will not let you down. No shocks: It is absolutely normal that when you have to fight a big fish, the shocks and wobble created during the fight, will not let you land the fish. Fortunately, this line can absorb all shocks to provide the smoothest fishing experience. Finally, we can see that the line has some very good characteristics and will serve your fishing purpose. Trout has sharp teeth, and we decided to add this product because it is abrasion resistant. The only negative point here is that it has high memory. You will notice it from the first use. However, it does not play an important role in trout fishing as it only affects casting performance. First of all, it is important to mention the fact that KastKing won the ICAST Award in 2015 as the best fishing line brand of the year. As we already mentioned above, trout have a really good vision, and they inspect the lure before biting. The only solution is to make the line completely invisible. Thanks to the fluoroKote KastKing line which is 100% fluorocarbon coated, once the line is in the water, it will “disappear”! This fishing line has many fans all around the world due to the low price and quality. Material: The line is made of copolymer coated with 100% fluorocarbon. Both durability and invisibility are the features that make the line special. Trout will not notice the line at all. Additionally, you can fill a glass of water and throw at the same time a piece of the KastKing Fluorokote line and a common line. You will see that the KastKing line sinks faster and smoother. Less Stretch: KastKing tried to reduce the elasticity of the line to provide a direct contact with the fish. A normal line will stretch 10% more than the fluorokote line and that will also reduce the landing opportunities. Small Diameter: Some previous fishing line models, similar to the fluorokote, were too thick. KastKing took to heart that many people want to load their reel with more line. Consequently, they gave to this line a smaller diameter, and you are ready to fight a big fish. Summarizing, trout cannot see this line in the water even though it is only coated with fluorocarbon. An excellent selection if you are constantly fishing or not. However, many people say that it is not tough and cannot hold hard knots; we would like to say that it depends on the target fish. If you select the right break strength from 4 lbs. up to 30 lbs. we can ensure you that no problem will occur. Undoubtedly, it goes without saying that this line deserves a place as the best fishing line for trout. Stren lines are all “made in the USA” and manufacturers test their lines before launching them. Stren knows that the elements of nature can ruin your line so they managed to enhance the strength of the stren original mono line. UV Protection: Stren incorporated UV protection filters in the line because sunlight is a serious enemy of every line. Durability: Strength is the only word that could describe the line. Every angler knows that if you have a big trout on the hook, your fishing experience will not help you. If your line is tough and has good knots, you will be able to land the fish. Low memory: Are you fed up with line twists? Does your line break easily? With the Stren line, you will not have these problems. Most lines “remember” the shape when they are on the spool. When it is wrapped around the spool, and especially if the line is old, you will surely experience line cuts. Sensitivity: Trout is a clever fish, and many people say that they cannot feel the bites immediately. This line gives you the opportunity to have a direct contact with the fish. It maximizes the” bite feeling” even if the fish are small. Since you are looking for a good fishing line, you probably know that the sun is the major damage factor of all lines. The Stren line will not let you down. Despite the fact that it is quite thick, there is no need to overload your reel. First of all, the basic rule of fly lines is to choose the same weight as your rod. This line designed by Sougayilang has a perfect weight and the casting performance will surprise you. It is a floating type fishing line, and that makes it the best fishing line for trout. Surprisingly, there is a money-back guarantee if the quality will not satisfy you. Moreover, it is available in four colors for various fishing occasions. WF: Weight Forward taper means that the line is heavier in the “head” (front part). It is proven that WF lines are better than double tapered lines. They give you a better casting performance, and of course you can cast the line far. Line Construction: The majority of fly lines are made of simple fibers and threads. However, if you take a closer look at the Sougayilang line, you will notice that it consists of multiple braided threads. It will surely withstand the harsh teeth of a trout. Tip: It would be a really good idea to pair the fly line with fluorocarbon leaders. The colors are enough bright, and they are visible. However, the fluorocarbon leaders will definitely help you. To sum up, if you are a fly fishing fan, you should not overlook this line. Many people have it and many would agree that it is the best fishing line for trout. Fly fishing is the major technique for trout (all species) and the success rate is high. Once you get the Piscifun sword WF line, the first thing you will notice is the great floatation. After testing the line we can ensure you that it stays on the water surface even after 24 hours. Additionally, it has a loop at the end, and it comes in five colors. We would like to underline the fact that it is slightly thicker than common fly lines so you do not have to worry about twists or wind knots. Fly Line Core: As a matter of fact, the line is made of many braided threads. Thus, Piscifun enhanced the strength in order to use it for big fish. Moreover, the multiple threads protect the line from the sun. Loop at the end: You may find this feature unnecessary, because most people can make their loops and knots. However, many of us fishers face some difficulties in attaching the leader line. Consequently, manufacturers decided to make our life easier. WF Taper: Gone are the days when we used double tapered fly lines. The sword line is weight forward tapered which means that it is heavier at the end. Great casting performance, especially for beginners, is a major advantage. Finally, if you want to invest in the best fishing line for trout, you should try this. 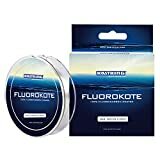 Many anglers all around the world use it because it has some unique features. The details make the difference. Trout fishing is not only an adventurous hobby, but also a psychological therapy. It is scientifically proven that people who are fishing are more healthy that others who are not. You can find trout all over the US because it is the most common freshwater fish. Why should you not give it a try? Stay tuned on our website, learn all the necessary information, grab your fishing tackle and let’s go fishing! Please share the article if you like it or throw a message in the comment box below.